Mr Quinn's sculpture is a "tribute to disability and motherhood"
Two sculptures have been selected to be displayed on the vacant fourth plinth in Trafalgar Square. 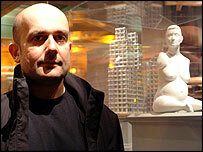 Alison Lapper Pregnant by Marc Quinn and Hotel for the Birds by Thomas Schütte beat four other nominations. The winners were selected by the Fourth Plinth Commissioning Group after taking comments from the public, who saw scale models at the National Gallery. They will be shown for up to 18 months each from spring 2005, starting with Mr Quinn's disabled, pregnant woman. The other shortlisted contenders included a car covered with bird droppings and two life-size Tomahawk cruise missiles. The decision to recommend two works for the fourth plinth marks a departure for the commissioning group, which had originally intended to recommend a single work. "Both of these proposals have extraordinary artistic value," said Sandy Nairne, chair of the group. "Though they could not be more different from each other, both sculptures will be of compelling interest to Londoners and visitors. "They will enhance London's reputation as a leader in the visual arts." Broadcaster Jon Snow, part of the commissioning group, said the decision to recommend two works had as much to do with logistics as aesthetics. 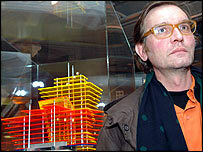 He said: "The fourth plinth has been empty for three years since the very successful commissions between 1999-2001. Thomas Schütte's piece will "sparkle like a brightly-coloured jewel"
"The selection of two works at this stage will jump-start the programme and put clear plans in place for installations over the next few years." Mr Quinn's sculpture is to be made in white marble. Artist Alison Lapper, with whom Mr Quinn collaborated on the piece, said: "I regard it as a modern tribute to femininity, disability and motherhood. "It is so rare to see disability in everyday life - let alone naked, pregnant and proud." Mr Schütte's piece will be made of acrylic. Andrea Schlieker, curator for the Fourth Plinth Sculpture Commission, said: "Multi-layered, mysterious, and promising to sparkle like a brightly-coloured jewel, Schütte's utopian architectural vision will have a powerful impact on Trafalgar Square." Every other year, artists from around the world will be invited to develop contemporary artwork for the landmark site as part of a rolling art programme. What do you think of the chosen sculptures? What would you put on Trafalgar Square's fourth plinth? So, the statue of Ms Lapper "celebrates...her own body as a thing of beauty." And here I was thinking beauty is what lies beneath the surface. Make up your mind, guys. On a different note, I find it frightening how fans of the shortlisted works have been so snobbish. "You don't understand it, you're a philistine," they say. Not so. As they say, some people really were born yesterday. You've all been conned. Open your eyes. Modern art is empty in content and, so, in that respect, the empty plinth remains empty! I saw the Marc Quinn sculpture at his Liverpool Tate retrospective show and thought it a truly stunning piece of art: thought provoking AND aesthetically beautiful. My only concern for it as an outside sculpture will be the weather and how that may affect it? Congratulations to Marc Quinn, nonetheless. That can't be the best of British sculpture. Even the Turner prize had better pieces then these choices and that a pretty damning criticism for any artist to bear. Have these people ever stopped to consider the context of their display? I am not knocking or mocking modern art. It has its place. But Trafalgar square? On the fourth plinth? Have these people ever stopped to consider the context of their display? The first time I stopped to take a closer look at Nelson's column and the powerful images that surround the base, I was moved by the sacrifice and efforts of those who paid the price for our country. Please have modern art displayed in a more appropriate context. Not that of our heroes. Whilst I think that something less modern would be far more appropriate for the fourth plinth I have to admit that Marc Quinn's statue is wonderfully thought provoking. However, it is not appropriate for Trafalgar Square, the ghastly plastic thing is even less so. The white marble will not fit in however much I admire the statue. Why can't we have a permanent memorial there to either a single battle - the Battle of Britain perhaps? or to all the fallen heroes of the last century. Are we becoming a nation of bigots? Quinn's work is a figurative sculpture just like many of the ones already in the square. Where it differs from the others is in asking us questions about what beauty is and in moving the concept of triumph against adversity away from the one of war, enabling us to broaden our terms of reference and indeed our minds. This is surely just as or perhaps more worthwhile than showing us what a dead general looked like! Disability is consistently shunned, shut away and ignored by society. The sculpture of Alison Lapper is not only depicting the beauty of a pregnant woman, it is also bringing awareness to the public that those with disabilities can be and are loving and brilliant parents. A tribute to the country. Long may it last. So much public art in London is ancient, irrelevant and ignored. I LOVE the sculpture of Alison Lapper ! Her unique physical beauty and the artist's exquisite use of white marble make this a doubly luminous work - simultaneously thought provoking, inspirational and wise. Art should make us all look again, think twice, and move on marked in some way by the whole experience. A fantastic choice. What a load of rubbish. Surely the fourth plinth deserves something more fitting to our nation's history and achievements. Personally I would have liked to see a tribute to the Battle Of Britain, without whom we would have no fourth plinth to make use of. As a Visual Arts student in the Academy of San Carlos est. 1790 I think it's great that Marc Quinn's sculpture caught the Commissioning Group's attention not only for it's on the edge aesthetics but also for what it stands for. But I feel sorry for all of the people who are not able to broaden their criteria and perspective. The coldness of some of the comments above is shameful. I think it should be left empty until something worthy is produced. Its emptiness would be a reminder of the sorry state of modern art. Isn't it amazing how the UK and the US have become more prudish over the last 200 years! We have a statue of a naked, disabled, pregnant person causing consternation. In the US we have bare breasts on statues in the Justice Department being covered up! Hoorah for Quinn. An excellent choice. I'm a fan of modern art, but the pieces short-listed for the forth plinth were, frankly, rubbish. When Rachel Whiteread's upturned plinth was on display in Trafalgar square I made a trip especially to see it, but I doubt I'll be doing the same for these two. In these days of computing, a statue to Alan Turing would be just the biscuit. When oh when are we going to have a statue of William Shakespeare? The two pieces are quite a disappointing choice for the fourth plinth. "No-o-war-r" was by far the most engaging piece, which seemed to have the most thought put into it and would have contrasted well with the spirit of war in the square. It would have been a far better representation of society today. I don't think that Trafalgar square is the place for this modern art rubbish. None of the suggestions are in keeping with its surroundings. If they want to display these monstrosities, there's the Tate Modern where these eyesores can be hidden away. They should have went with a more classical style of sculpture. The fourth plinth is a wonderful showcase for contemporary art. Some previous 'tenants' of this site have been outstanding. Would that we had more such art in public. These 'artists' punch above their weight. These sculptures mean nothing to most Londoners. Maybe we are too stupid to understand their worth, I don't think so, these are the Emperor's new clothes for Trafalgar Square. Trafalgar Square is named after one of the greatest battles in our history. It is filled with statues of some of our greatest military and naval commanders. This travesty is an insult to them and to our country. The so-called 'art experts' should be ashamed of themselves. Sadly, I suspect they'll simply pat each other on the back for recognising some talentless nobodies. Trafalgar Square was meant to remind Britons that they have endured through great tests. Why not have three heroes of British history, 'the soldier, sailor, and airman'? With so many powerful historic figures to draw from in our county's heritage, why do we have to have such modern rubbish on display? Is it now politically incorrect to be proud to be British and want a statue to one of our heroes? What on earth are we coming to in the 21st century? No wonder the English are giving up and emigrating in their thousands. Hold the aircraft, got room for one more? Speechless! Absolutely speechless. Is this really the best of the bunch? In a square already celebrating the best of British could something more topical not be found? How about celebrating Britain's sporting achievements? Or our technological achievements? Was the Queen Mother or Princess Diana universally accepted as an ideal monument. That really would have been a source of national pride. If James, Loughborough's case is that the Queen Mother or Princess Diana are true examples of national pride" he really should acquaint himself with 21st century Britain. The Empire, and with it, the monarchy, is not representative of modern Britain, and the idea to have 12-month rolling installations on the 4th plinth is a great opportunity for Britons and visitors alike to see how powerful modern art can truly be. It may not be to everyone's taste, but since when is art universally popular? This competition has meant many people's eyes have been opened to new media, which surely can only be a good thing? I think the Hotel for Birds is a fantastic idea. There are thousands of pigeons in Trafalgar Square, why not give them a home? Things like this are always criticised, but the quality of design will shine through and Londoners will eventually be won over by them. Maybe I'm getting old, but this really is rubbish. I remember seeing one sculpture on this very plinth. It was a pile of books, with a tree growing from them. I don't know what it was called , but it seemed to at least have a message, some meaning. This is just not very good, or as my son would say, pants. The shortlist was exceptionally , even surprisingly, poor, and should have led to the competition being re-opened. Art for the plinth is a good idea, but these will do the promotion or dissemination of art no good at all. Schutte's piece is certainly the best, but has already been seen at its best. The rest were amazingly thoughtless and uninspired, with the honourable exception of the anti-war piece. But art should be thoughtful or thought provoking. Sadly the Quinn is the most pitiful of all: safe, craven, turgid art. What its success says about art and about us is profoundly depressing. Surely the protesting crowd scene was the logical choice? Trafalgar Square is the centre of protest and public gatherings in this country and the other suggestions have no place there. The shortlist didn't exactly sparkle with artistic merit, but the best of the bunch was surely the 'No-o-war-r' piece by Sokari Douglas Camp. It had an engaging subject that was relevant to the location and it was scaled in proportion to the plinth and the setting. Mark Quinn's piece might look OK in a gallery, but seen from below (from the pavement level of the square) it will look like a legless torso sticking out of the plinth. Modern art is rubbish, this lot especially so. I think the plinth should be left empty as a reminder of the story of empire. Quinn's work is as good and as troubling as ever. Not sure about the Schutte piece, which looks very 'public art' .Might look ok in situ, I suppose. How grudging is that!? Why do so many people keep on insisting that the plinth always used to be empty? Does no-one remember the statue of Gordon? The hero of the Sudan? The martyr of Khartoum? General Gordon was a true example to all - a brave and honourable man who abhorred unnecessary violence and who never carried a gun. Why was Gordon's statue quietly removed when Napier and Havelock remain? We should return Gordon to his plinth and forget about these modern sculptures. The panel have made a wise decision, one that I think will be very popular with most Londoners, not in selecting the two they did, but in rejecting the truly pathetic effort put forward by Sarah Lucas.